The dam at Lindridge Pool was made in 1697 by permission of the Warden and Society of Sutton Coldfield, William Jesson paying an annual rent for the pool. His lease was for 1,000 years at three shillings per annum and a dish of fish and six bottles of wine. This was a very late example of rent being paid in goods as well as money. Payment in kind was more common four hundred years earlier - in 1297 the Earl of Warwick allowed John, Lord of Little Barr (Perry Barr), to have some woods for an annual payment of six barbed arrows, to be delivered at Sutton every Michaelmas. The fifteenth century bailiff’s accounts for Sutton show that almost all the rents were paid in money, except for eighteen hens, twenty-four arrowheads, and a glass goblet. By 1480 these items were symbolic, the actual rent being paid in their money value - the bailiff accounted for four shillings for the hens, “12d the value of 24 arrowheads, at ½d. a head this year” and a penny for the goblet. In 1433 the bailiff accounted for “a pound of pepper due in rent at Christmas”. Peppercorns were practically an alternative currency in the Middle Ages - they were compact and could be kept for years without losing their flavour. The annual payment of pepper was still being made long after the hens, arrowheads and goblet had been forgotten. The last reference to pepper as rent is in the court roll for 1604 - John Ediall sold some property in Sutton to Walter Stanley, and the Court Roll records “Respecting which one pound of pepper falls due to the lord by way of relief”. 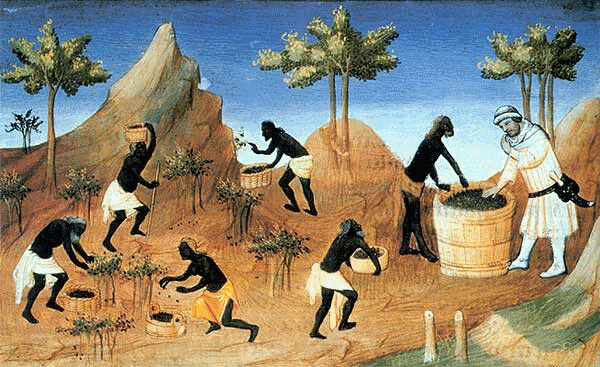 Illustration of pepper being harvested for a European trader, from a medieval manuscript “Le livre des merveilles de Marco Polo” (The Adventures of Marco Polo) date unknown.